Eamonn Fitzmaurice’s side contained seven championship debutants and they thrilled a large crowd in Killarney. David Clifford signs autographs after the game. KERRY REMAIN ON course for a sixth Munster title on the trot after a youthful side containing seven championship debutants accounted for Clare by 22 points this afternoon. 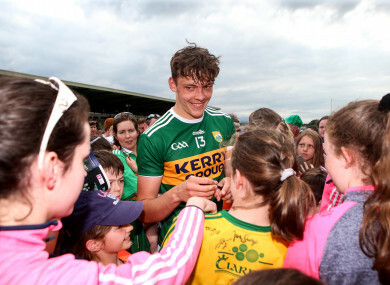 A crowd of almost 17,000 turned up to see what the future of Kerry football looks like and it looks good, although Kerry manager Eamonn Fitzmaurice and his players will know context is everything. Clare were woeful all through this contest and it was shades of the 1980s and 1990s rather than the positive overtures Clare football has been making in the last few seasons under Colm Collins. Tougher tests lie ahead for the summer but 32 points — 23 from play — is decent kicking, even if the long wait for a Kerry goal continues; it’s six games now since they raised a green flag. That would be nit-picking on a day when the defending Munster champions were clinical in their point scoring. New boys Sean O’Shea, David Clifford and Michael Burns scored 11 points between them, enough to beat Clare on it own, and the Kingdom now have three weeks to lay their plans for a long-waited return to Pairc Ui Chaoimh to face Cork in a provincial decider. When James O’Donoghue slung over his first point it meant all six Kerry forwards had scored from play by the 21st minute, at which stage Kerry led 0-10 to 0-3, as Clare’s challenge trailed off before it really began. Fitzmaurice will be pleased with the purpose and pace with which his players went at Clare; something that was often lacking in their league performances. Strange, then, that Clare scored the first two points of the game through Eoin Cleary and Pearse Lillis but once Kerry hit their straps they simply crushed the visitors. Burns landed Kerry’s first point, followed by scores from teenagers O’Shea and Clifford, and they were four points to the good when David Tubridy scored Clare’s third from a tight angle. Paul Geaney responded with a brace of extremely well carved out scores to put Kerry five ahead, and scores from Stephen O’Brien, O’Donoghue, Burns, O’Shea — before Jack Barry blasted the ball over the bar with just Eamonn Tubridy to beat — helped Kerry to an unassailable 0-16 to 0-4 half time lead. The second half was target practice for Kerry, with Barry John Keane coming in to kick three points from play. Cameo appearances from Anthony Maher, Darran O’Sullivan and Kieran Donaghy raised cheers from the home support as the Clare contingent headed out early for the ferry home, and it’s three weeks now before Kerry will hope for a similar performance against Cork in the Munster final on Leeside. Scorers for Kerry: S O’Shea 0-7 (4f, 1 ’45′), P Geaney 0-7 (1f), J O’Donoghue 0-4 (2f), S O’Brien 0-3, BJ Keane 0-3, M Burns 0-2, D Clifford 0-2 (1f), J Barry, A Maher, M Geaney, D O’Sullivan (f) 0-1 each. Scorers for Clare: E Cleary 0-5 (4f), D Tubridy (1f) and J Malone (0-2 each), P Lillis 0-1. Email “Youthful Kerry provide a glimpse of the future with demolition of Clare”. Feedback on “Youthful Kerry provide a glimpse of the future with demolition of Clare”.